Clear Capital(R): Bakersfield, CA Tops Metros With Largest Projected Gains Through Last Half of the Year. Really. Las Vegas Projected to Lead Metros With Total 2013 Price Growth. TRUCKEE, Calif., July 2, 2013 (GLOBE NEWSWIRE) — Clear Capital (www.ClearCapital.com), the premium provider of data and solutions for real estate asset valuation and collateral risk assessment, today released its Home Data Index(TM) (HDI) Market Report with data through June 2013. Using a broad array of public and proprietary data sources, the HDI Market Report publishes the most granular home data and analysis earlier than nearly any other index provider in the industry. — The forecast through June 2013 reveals trends that highlight the overall recovery’s strength and potential for sustainability. Nationally, home prices continue to benefit from the more active spring buying season. — Quarterly, yearly and two quarter forecasts all came in stronger at 1.4%, 8.6%, and 1.7% respectively, relative to months past. — A more optimistic update to our total 2013 national forecast of 6.0% over the 2.6% growth projected in our April 2013 report is attributed to increasing home price gains across much of the nation, continuous improvements in distressed market measures and improvements in broad-based economic inputs, such as consumer confidence. — Should 2013 forecasts be realized, the housing market would outperform historical average gains between 4.0% and 5.0%, but indicate moderation from the current yearly gains of 8.6%. — Regionally, home price gains saw moderate growth in the short-term, long-term and forecast. gains of 10.1%, 5.2%, 4.6% and 4.1%, respectively. These gains are comprised of year-to-date growth and two quarter forecasts of 2.2%, 1.5%, 1.8% and 1.5%, respectively. Moderation is key to a sustained recovery. With this in mind, projected regional growth rates are healthy compared to year-over-year gains through June of 17.1%, 7.1%, 6.2% and 4.3%, respectively. — While metro level market trends showed continued variability, they remained positive overall. Local market economic fundamentals continue to drive varying degrees of price growth. — 45 out of the top 50 major metro markets are forecasted to see yearly growth over the final two quarters of 2013. Four of the five markets not expected to see home price gains over the next two quarters are projected to see declines of less than 0.5%. — Las Vegas held its lead in June with yearly gains of 29.3%. The metro is one of six others to have realized more than 20.0% in yearly growth. Considering the two quarter forecast for Las Vegas of 5.0%, the metro will likely end the year as the recovery front runner with total 2013 gains of 19.4%. — Bakersfield, CA’s two quarter forecast of 5.2% puts this metro in the lead for short term anticipated gains out of the top 50 metros. Bakersfield moved from 29 in March’s Forecast to the first position in June. This leap is an example of the fundamentals driving the overall recovery. 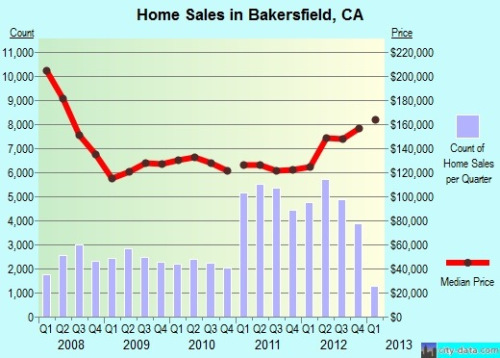 Bakersfield shares many characteristics of a First In First Out Recovery and serves as a reminder that the recovery continues to unfold market by market. This market was hard hit in the downturn and now offers an attractive opportunity for homebuyers. From the peak, prices are currently down 54.3%, substantially more than the national losses of 34.2%. Additionally, REO saturation remains relatively high, but on the decline at 21.3%. And overall median prices are relatively low at $160,000.